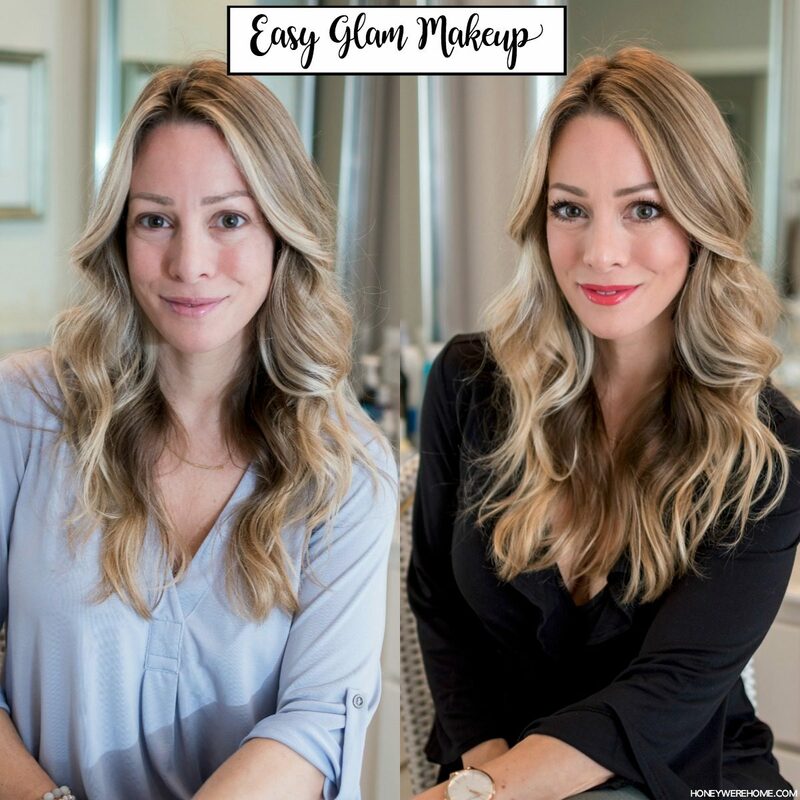 Last week I shared my Easy Everyday Makeup tutorial with you and that’s a great way to look put together quickly! Today, it’s time to take it up a notch for when you want to feel a little bit Extra! 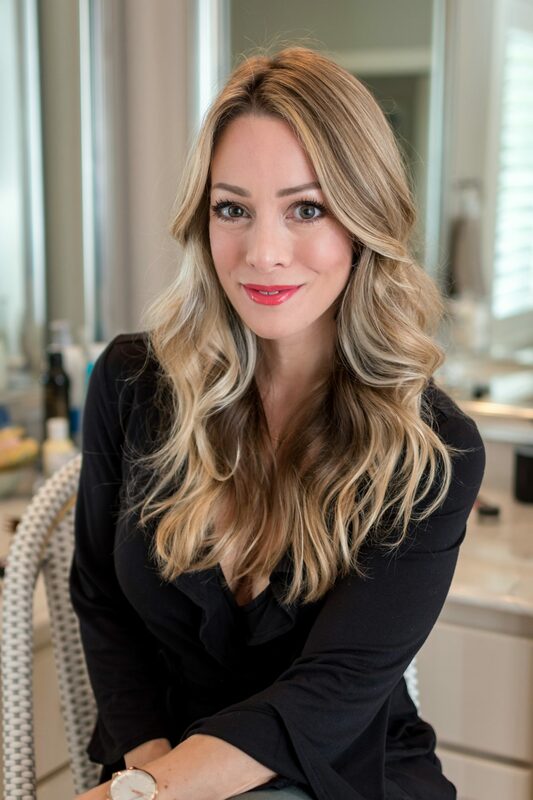 I usually do my makeup like this when shooting professional photos for my blog or for a party or date night. It’s only a few more steps, but the difference is dramatic and includes an easy way to contour your face to emphasize your best assets! Liquid Foundation • For special occasions and photo shoots, I like my skin to look ultra smooth and flawless, so I’ll use this foundation to give me that full coverage. It feels good on, isn’t heavy and it gives a pretty finish to your skin. Because I don’t normally wear liquid foundation, I can’t stand one that I can feel on my skin if that makes sense. This one feels like I’m not even wearing it, which is partly why it’s my favorite. I’m color Creamwhip. I apply the foundation with my Beauty Blender. Concealer • The foundation above has concealer in it, but because I want my under eye area highlighted, I add an additional lighter concealer. 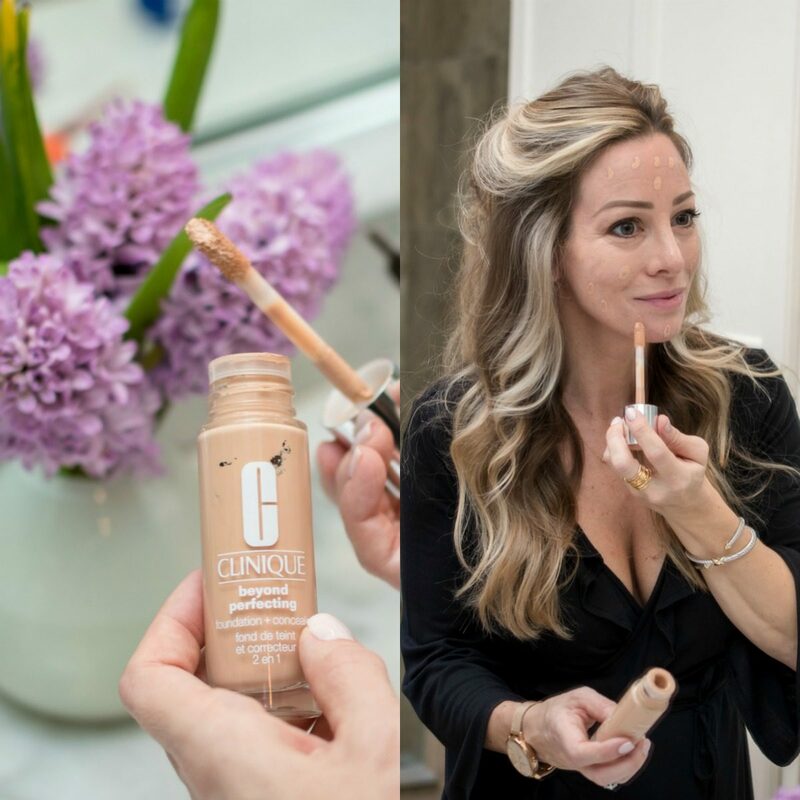 I like this concealer for brightening up the areas under my eyes and making this area smooth. But, because I’m over 40, I don’t put concealer right underneath my eye, rather a tad bit lower because otherwise it tends to magnify the fine wrinkles under my eyes and make me look 140! I’m color 110 IVORY C.
Setting Powder • I use this powder to set the the liquid foundation. I’m color Buff 2, 220C. Smashbox Contour Kit • For an easy contour, this kit has three shades that give you a more defined and highlighted face. I love this one because the shades look natural on and it comes with a great angled brush! 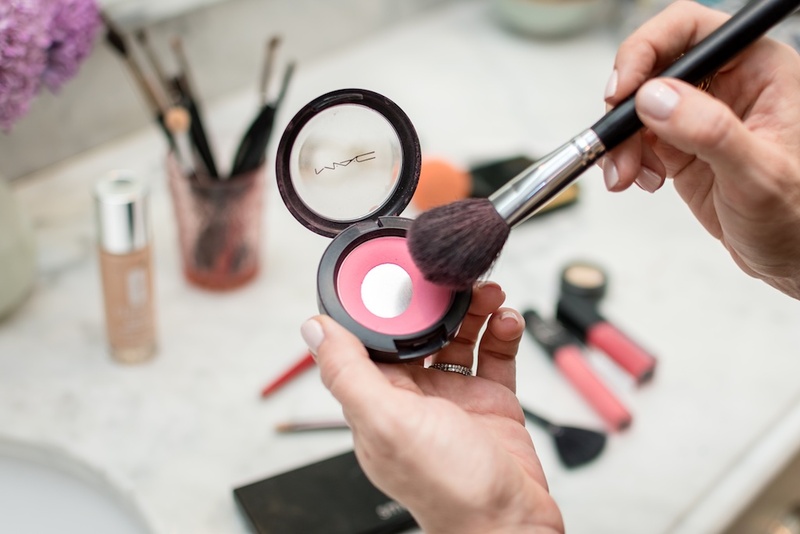 MAC Powder Blush • ‘Pink Swoon‘ blush gives you a nice, youthful glow! Eyeshadow ‘Nylon’ • For an extra bit of highlight at my eyes, I use this this shimmery gold color in the corner of my eyes and below the brows. I also sometimes add it to my lips at the cupid’s bow. Eyeshadow ‘Smog’ • I’ll use this shadow to smudge and deepen my eyeliner to make my eyes pop. Smashbox Matte Lipstick • Bright lipstick shows up better in photos, so even if you feel like it’s really bright in person, it will be just right in a photo! 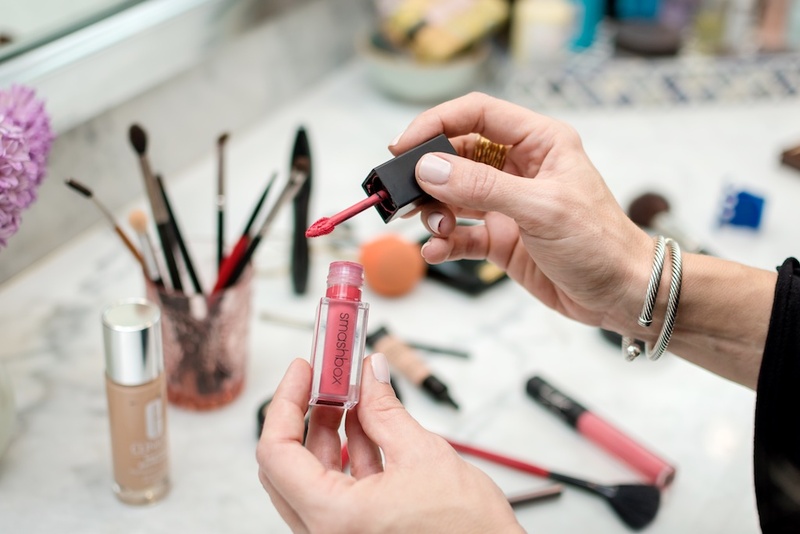 this one goes on liquid, but dries matte and lasts all day! Gloss • For a bit more shine, I add a gloss on top. Mascara • I add an extra coat of this mascara for super long and voluminous lashes. I already have my eye makeup on here and have filled in my brows, so let’s start with getting your skin picture perfect. I dab the foundation onto my face all over. This applicator is nice for letting you apply the foundation without having to get your fingers in it and lets you dab just enough exactly where you want it. 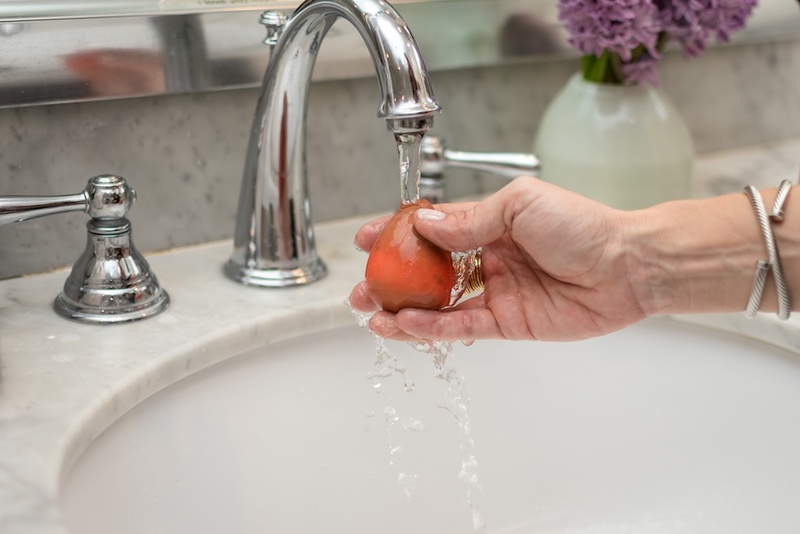 Wet the beauty blender (it will expand when filled with water), then wring it out to get the excess water out. Then blot all of the foundation into your skin making sure to get under your jaw and onto your neck. 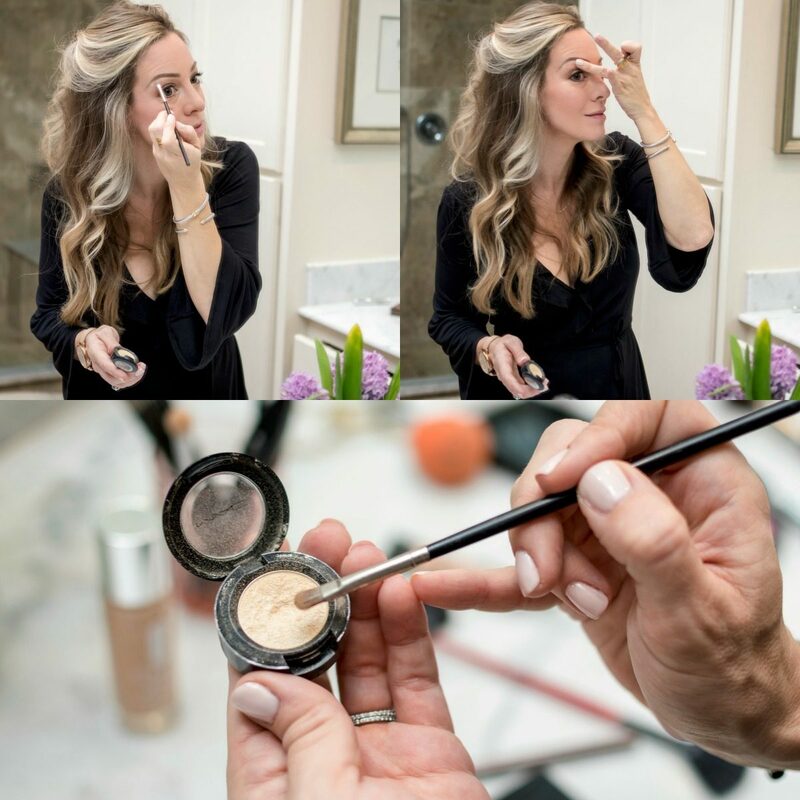 Take your time with this step to get the best coverage and most flawless finish. I usually start with the larger end of the beauty blender and end with the tip for more precise blending. If you want to brighten up your under eye, dab a tiny bit of concealer under your eyes. I concentrate more on the area just above my brow bone so I’m not getting into the fine lines right below my eye. A little goes a long way, so you don’t need that much! Then, take your time patting it all in with your light ring finger until it’s well blended. I didn’t get a photo of setting my foundation with the pressed powder, but that’s the next step. You can use the powder applicator that comes with it to apply the powder all over your face and into your neck. Then it’s time for contouring. 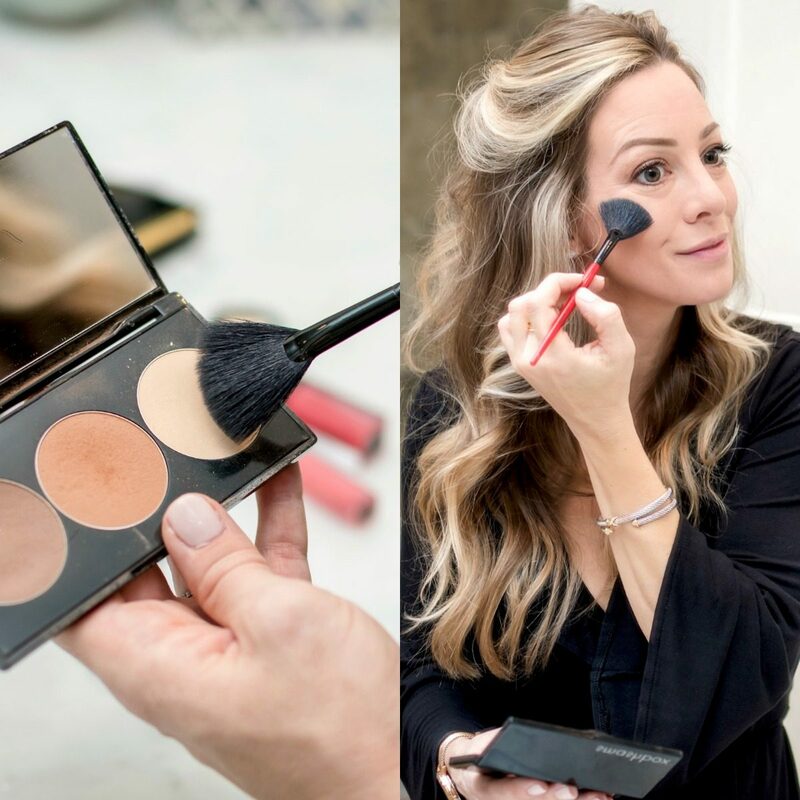 Lots of women are intimidated by this step, but this contour kit makes it really easy! It comes with an illustrated guide to help you know where to apply each shade and an angled fluffy brush that helps you apply it perfectly. Just remember, the darker shades ‘hide’ areas and the highlight ’emphasizes’ areas. I should probably add this to my everyday routine because it makes such a nice, subtle difference in your face when you do this step! To get the look, starting with the darkest shade in the contour kit, use the angled brush to apply it around your forehead, just below your cheekbones and under your jawline to make those areas recede. 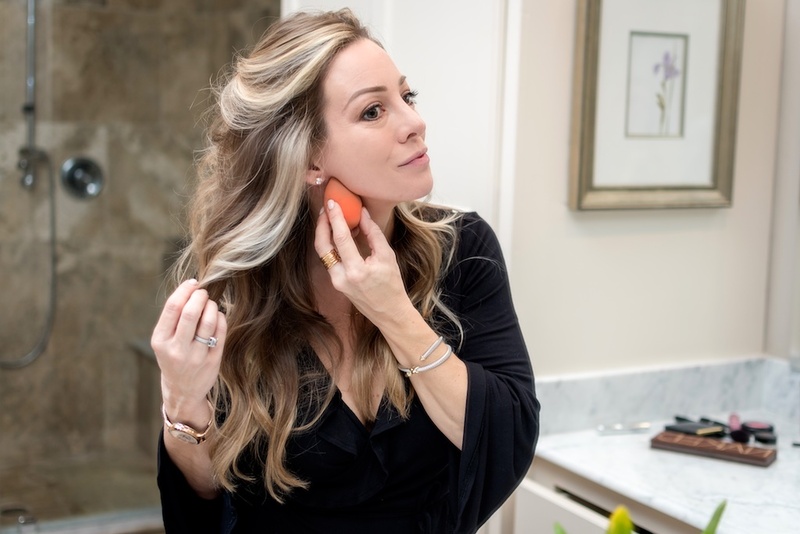 For me, I have rounder cheeks and a larger forehead, so I like to help chisel those areas. Then I take a small angled brush to apply the same darker shade from the inside of my eyebrows down the sides of my nose. That helps slim the appearance of the nose. 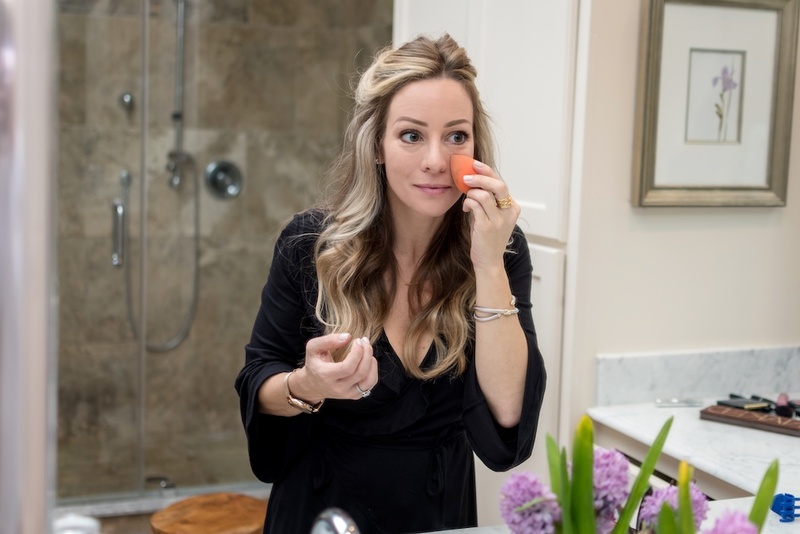 There are lots of complicated nose contouring videos and tutorials you can watch, but drawing two lines down the sides of your nose works really well and is so simple! 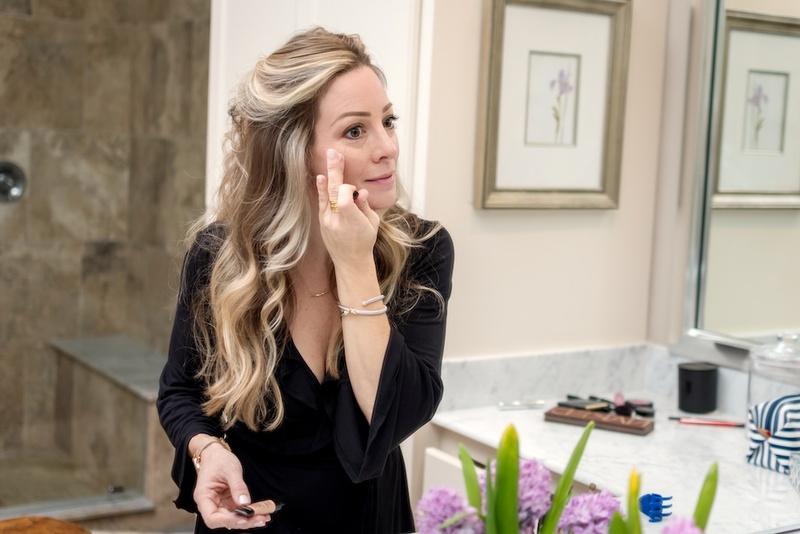 Next, go in with the bronze shade at the same spots to warm up those areas and blend the nose contour with your ring finger to eliminate any harsh lines. 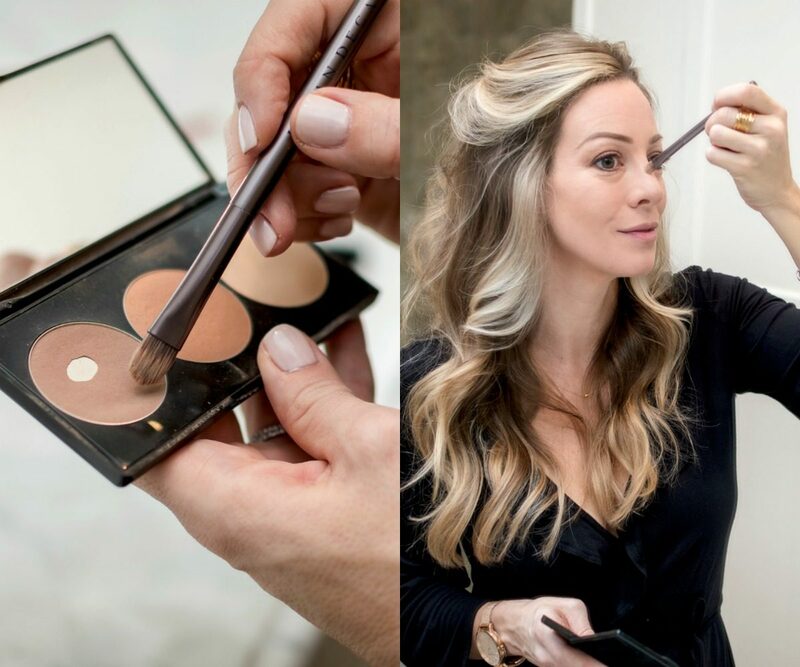 The last contour step is to use an angled brush to apply the highlight shade right on top of the cheekbones. You can highlight other portions of your face like the center of your nose and between your brows, but I stick with the top of the cheek bones. Then, add a sweep of blush across your cheeks for a rosy glow. And using a big fluffy brush, blend out everything out so you it looks natural from all angles. For an extra bit of highlight at my eyes, I use this this shimmery yellow/gold eyeshadow in the corner of my eyes and below the brows and then blend with my fingers. This really makes your eyes stand out, especially in photos. I use ‘Smog’ shadow to smudge and deepen my eyeliner to make my eyes look more softly lined and dramatic. Then apply one more coat of mascara for really bold lashes. And don’t forget you lips! This liquid lipstick goes on wet but dries matte. I love this shade that is a pretty bold pink and the angled applicator makes it easy to apply. And because I like a little shine to my lips, I add a dab of gloss on top. This one is great alone or over your lipstick. 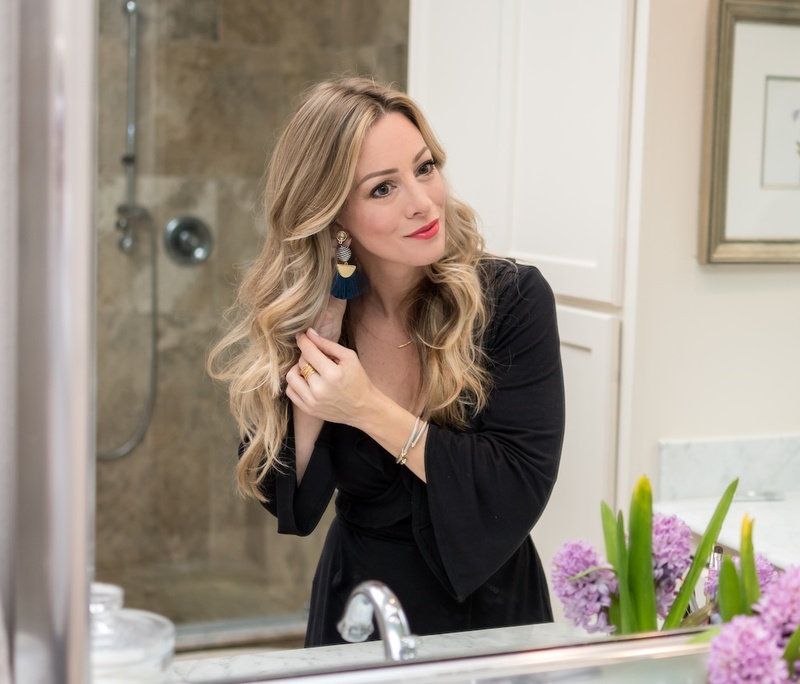 The finished look is photo or date night ready! This beauty makeup tutorial is is collaboration with Nordstrom and all the things I used to get my face camera ready with are from there! They have an extensive beauty department where you can easily get lost for hours. 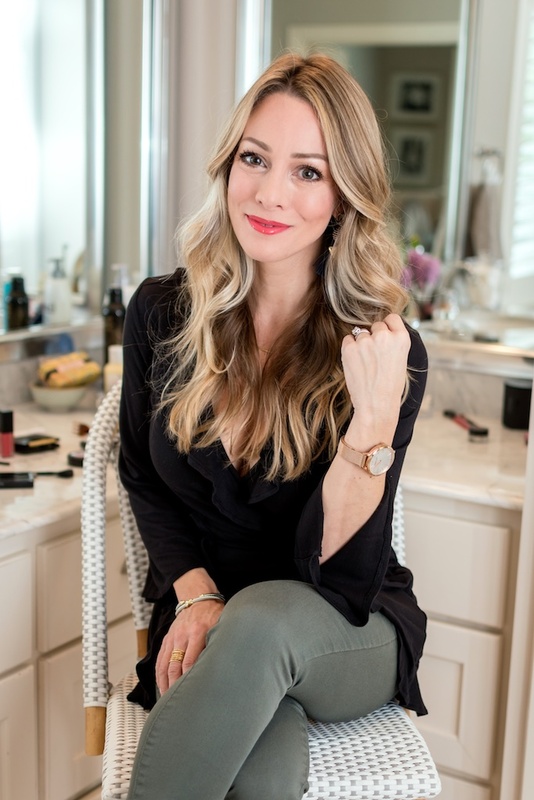 Their online beauty department is really easy to navigate too; you can shop by makeup, skincare, haircare, tools, etc. Right now, you’ll get a 16-piece gift set valued at $147 when you spend $125 on makeup! It’s a great way to try out some new products! I love playing with makeup and hope this tutorial was helpful! Let me know what beauty post you’d like to see next or what product you’d like me to review! I’m pretty good at a smokey eye and have a new way I’ve been curling my hair . . . Thanks for this! Your makeup always looks so fresh and pretty. Love that pop of lip color! Beautiful! What are the exact shades of lip gloss and lip color? Thank you! Thank you so much Kate! I always have to remind you that YOU were my first blogging inspiration soooo many years ago! And that you continue to stay fresh and relevant impresses me so much! Love the lip colors! What color is the Smash Box color? Nars? Thanks Val! The Smash Box is Baja Bound, and the NARS is a light pink- need to check the exact shade when I get back in town! By the way, LOVE your posts!! Thank you for sharing your tips and tricks!! Yes please! Also a smokey eye tutorial and the new way you curl your hair! Thanks Nina! I’ll add it to the list! Thanks so much! Looks great every time!